Paper, approximately 50 x 76cm. 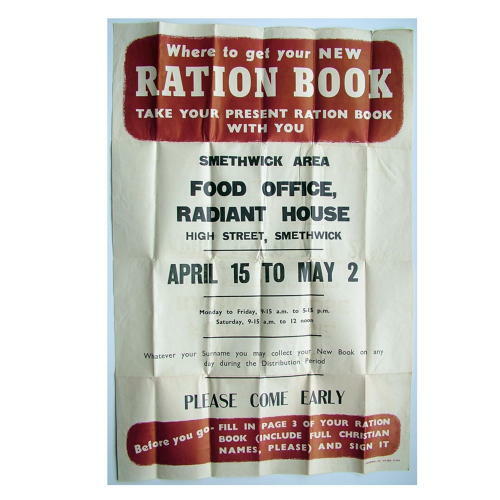 Printed by Colorprint Ltd. Poster produced to encourage civilians to collect their new / replacement ration books. This particular one was printed for the Smethwick area, a region in the West Midlands close to Birmingham. It has minor edge damage in places and has been folded but overall condition is very good indeed. A super poster that reminds us that virtually everything was rationed during WW2. An excellent display piece. As with everything this is guaranteed original. Stock code P21984.